Base of Operations: A seedy mid-town hotel room in Manhattan. Powers/Abilities: The Crimson Daffodil has a mutant power that allows him to dampen the circuits to the fear centre of the brain and reroute the signals to the pleasure centre, rendering people unusually co-operative. By then speaking to them he could then persuade them to do whatever he asked. He was only able to exert his influence on one subject at a time, though this was apparently due to lack of experience. Certain individuals, such as Ecstasy (to whom pleasure and pain are much the same thing) and the Marked Man (whose thought processes were not logically ordered), are unaffected by his power. He has a limited empathic ability to read his victims emotions. His persuasion power was the first, and initially the only, power he displayed. However he was acrobatic and strong enough to leap from floor to ceiling with ease. Later he manifested a super-burrowing ability and began wearing a Wombat costume. While the costume itself didn't appear to provide any enhanced physical abilities or powers, he had superhuman strength (enhanced to class 10) as a side effect of his burrowing powers, allowing him to burrow through reinforced concrete and solid stone with ease. He hadn't fully adapted to an underground environment as he needed to wear a mining helmet and lamp upon his head, but perhaps with time such adaptations would've developed see comments. History: (Cloak and Dagger III#6 (BTS)) - Crimson Daffodil's men take Tandy Bowen (Cloak) and Uncle Mike hostage as they enter a bank in mid-town Manhattan. (Cloak and Dagger III#7-8) - Seeing one of his men strike Uncle Mike, the Crimson Daffodil used his power to calm him down. Turning his attention back to the robbery, he persuaded the bank manager to open the vault. While the manager was letting them in, the Crimson Daffodil failed to see a guard activating the silent alarm. However, while his men where loading the money into swag bags, he soon heard the approaching police sirens. One of the robbers saw the police surrounding the building, and the guard tried to seize the moment. Crimson Daffodil calmed him down, but in doing so he had released the bank manager from his power. The manager grabbed the guards gun and tried to deal with the robbers only to be shot down. Fortunately it was just a flesh wound, but the police reacted to the gun shot and attempted to communicate. Detective Nales proposed to exchange herself and co-operation for the hostages, but once the detective had handed herself over the criminals decided to keep Tandy and Uncle Mike hostage too. While using Detective Nales to negotiate with the police, the Crimson Daffodil began fraternising with Tandy. While it was clear that the Crimson Daffodil detested violence, and also quite liked Tandy, his men intended to harm Detective Nales. Tandy revealed her Dagger costume and prepared to blast the gunmen, but was interrupted by the arrival of Ecstasy and the Disciplinarian. The Crimson Daffodil became caught up in the fighting and Dagger accidentally knocked him out with a light burst. When he awoke Dagger had defeated the Disciplinarian, while Cloak had defeated Ecstasy. He declared to Dagger that she had redeemed him and pledged his devotion to her before leaping through a skylight and escaping. 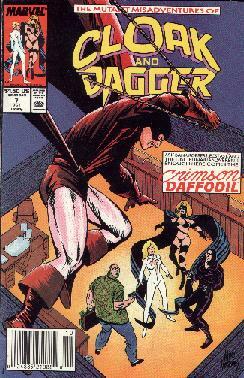 (Cloak and Dagger III#11(fb)) - The Crimson Daffodil decided to woo Dagger. He manifested a new mutant ability and, wishing to avoid becoming an object of familiarity, designed the new costumed identity of the Wombat. 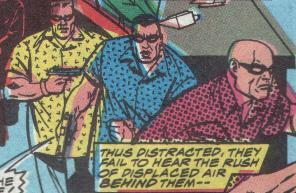 (Cloak and Dagger III#11) - As the Wombat read of Cloak and Daggers exploits in the newspaper he heard a police band radio report mention Cloak and Dagger and tracked them down. He burrowed down through to the Morlock tunnels where he faced the Marked Man in combat and was temporarily blinded by his inky secretion. The Wombat charged at the Marked Man only to be fling against a wall and winded. The Marked Man escaped with Dagger, and by the time the Wombat had recovered and dug his way back up to the nearest subway station the Morlock had been arrested and Cloak and Dagger gone. (Civil War: Battle Damage Report) - Tony Stark considered Crimson Daffodil as a potential Initiative recruit. Some mutants wait years for a secondary mutation. The Crimson Daffodil has only three appearances and yet in each of his adventures he's developed a new power and identity! If that trend had carried on he'd be a one man army by now! Normally if a mutant has more than one ability they seem to be related but the Crimson Daffodil's powers are completely unrelated. An adaptation to underground environments (thermal vision etc) would've seemed like a natural side effect of his burrowing powers, and perhaps he would've developed in time. 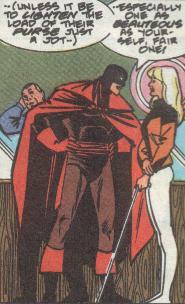 It's interesting to note that he had a desire to woo Dagger and his new costumed identity was an attempt to make himself more interesting. I've noted that some marvelites have a theory that a mutants subconscious thoughts affect the development of their powers. I don't beleive that theory works for all mutants, but in the case of the Crimson Daffodil perhaps his desire to be more interesting triggered the secondary mutation? "The Crimson Daffodil may be a rogue, 'tis true -- but let it never be said he visted harm on any soul whose path fate caused to cross his own -- (unless it be to lighten the load of their purse just a jot)"
Crimson Daffodil: Now, Madame, there is no reason for such a display of biterness... you're feeling calmer now, aren't you... at peace with yourself, you feel love towards all! Ecstasy: Yesss... as a matter of fact, I'm going to love tearing off your arms and legs and stuffing them down your stupid throat once I've offed the kid, here! Crimson Daffodil: Odd's Bodkins! Hate, pleasure, pain -- 'tis all one to her! Her mind -- 'tis like a pit of venemous vipers -- all strikeing one another! The name Crimson Daffodil would appear to be a play on the Scarlet Pimpernel. He even uses the french word "adieu" for goodbye. Perhaps he could team up with other verbose Marvel characters such as the Beast against a host of rhyming villains?! Crimson Daffodil's real name was revealed in the Civil War: Battle Damage Report. Correction to the gunmen sub-profile by Markus Raymond (Lester was killed by O'Rielly). The gunmen each wore brightly coloured patterned shirts, white gloves (which periodically turned flesh colour or vanished alltogether) and black bandeau's. Apart from that, none of them seemed particularly bright at all! Both Earl (in the blue) and Lester (in pink) struck hostages and earned themselves a telling off from their leader. The third unnamed gunman (in yellow) was killed by Ecstasy, Lester was shot by Brigid O'Rielly while he held Detective Nales hostage, and Earl was shot by the Disciplinarian.